If you're hiking up to Cascade Head for a view of the Salmon River estuary exchanging water with the Cascade Head Marine Reserve, don't forget to look down at the grassland vegetation. As the days get longer and warmer, the composition of the floral landscape continually changes. One special plant to look out for starting in late May through July is the bristly-stemmed checker-bloom. It is also known as the bristly-stemmed sidalcea and hairy-stemmed checker-mallow but is most reliably known by its latin name: Sidalcea hirtipes. 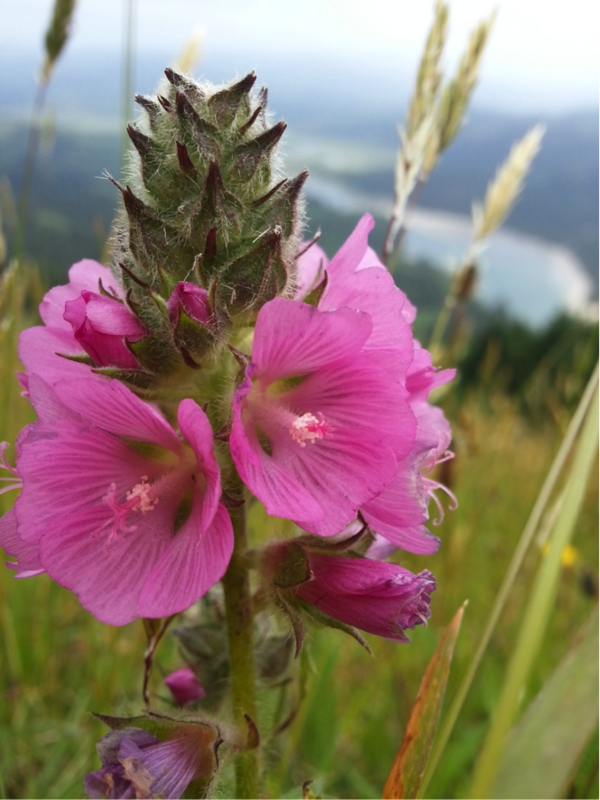 Although the plant's showy multi-flowered heads blanket the slopes of Cascade Head in pink each summer, it is actually a rare species due to the diminishing availability of its specialized habitat. It occurs only in northwestern Oregon and southwestern Washington on bluffs along the ocean and meadows in coastal mountains. It is listed as endangered in Washington, is a candidate for listing in Oregon, and is a federal "species of concern". The populations are few but they can appear large and abundant like at Cascade Head due to the plant's rhizomatous growth habit. This means their underground roots spread laterally and a large patch could just be one plant with many genetically identical clones. Sidalcea hirtipes is classified within the mallow plant family - Malvaceae. Flowers in this family are characterized by a funnel shaped flower with 5 separate petals surrounding a distinctive set of reproductive parts. The numerous stamens (those are male organs including the pollen-bearing anthers and a filament) are fused to create a column around the pistil (that's the female organs including the stigma, style, and ovary). You would recognize these features in a hollyhock or hibiscus flower, which also belong to the mallow family. 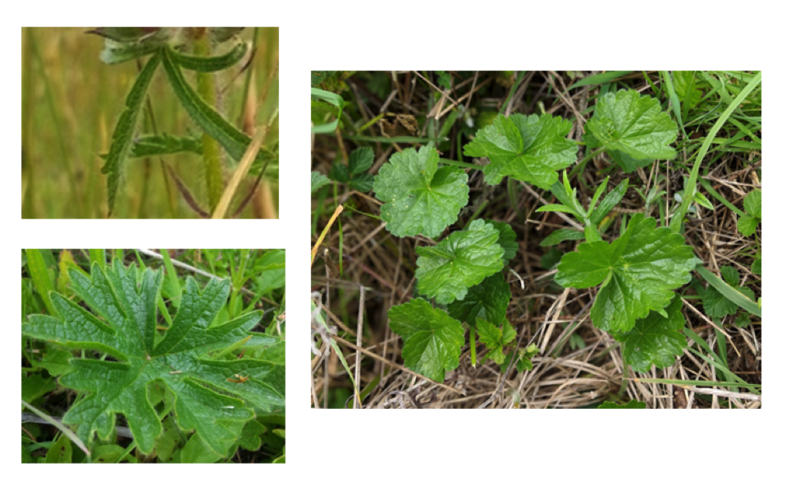 Another member of this family from Eurasia, Althaea officinalis, was used by the ancient Egyptians to form the original marshmallow, hence the name. Don't try your own recipes with our plants - remember, they're rare! Sidalceas can produce a variety of leaf shapes. 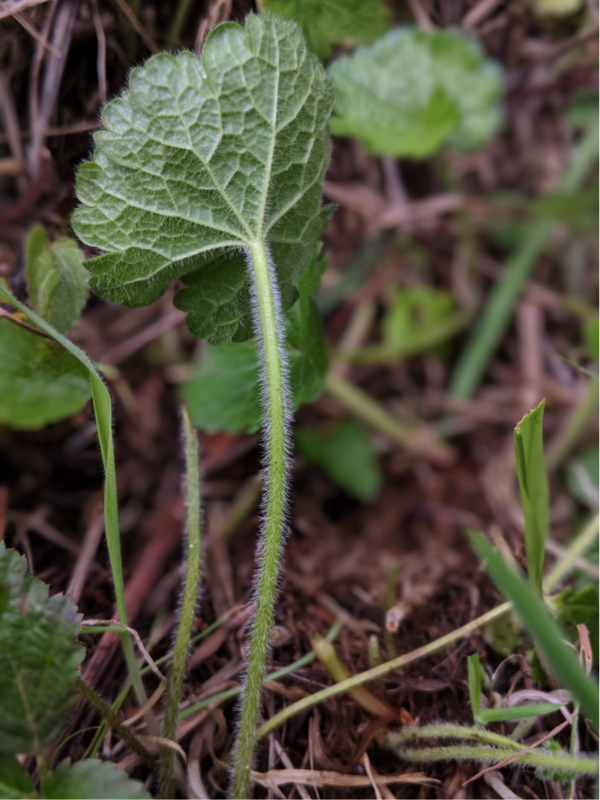 The basal leaves tend to be rotund with rounded teeth.Leaves growing on the flowering stem are highly dissected with many lobes creating quirky patterns. Sidalcea hirtipes also creates different plants with different sexual organs. Some plants have botanically "perfect" or hermaphroditic flowers - those with both pistils and stamens. Other plants just have female flowers. Studies on another coastal Sidalcea species with the same uncommon reproductive strategy have shown that predating weevils are attracted to the pollen of the hermaphroditic flowers, making the female flowers more successful in seed production. So that may be why plants seemingly disadvantaged with only a single type of sexual organ have persisted the evolutionary test of time. And of course, as you probably guessed, another distinguishing feature of this plant is the bristly or hairy stem. This underlooked detail is not as show-stopping as the flowers or leaves, but it is consistent and beautiful. To protect this rare plant, The Nature Conservancy manages its coastal prairie habitat on Cascade Head. One threat to this grassland is the conversion to shrubland or forest. This year we are working to combat that ecological succession in areas where shrubs have reached densities sufficient to shade out the grassland species. Crews from the Angell Job Corps and local volunteers have cut coyote brush to reduce their canopies. You may see the branches from these shrubs scattered on the grassland as you hike the switchbacks. They are drying out and will be consumed by a controlled burn this summer, which is intended to reduce thatch in the grass and open up bare soil for the germination of prairie species, such as our beloved Sidalcea hirtipes. All photos courtesy of Catherine Dunn, The Nature Conservancy. This contributed article appeared in the Sitka Center e-newsletter in May 2018.